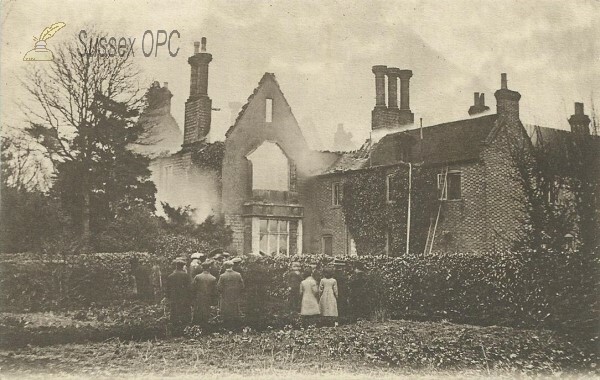 On February 27th, 1908, the former Vicarage of St Swithun’s church burnt down. I have not found a record of the cause of the fire. 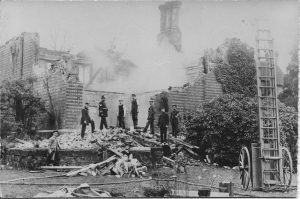 Once the flames took hold, the water pressure, in the days before the water tower in the Chequer Mead car park was built, was so weak that efforts to put out the fire were ineffective. 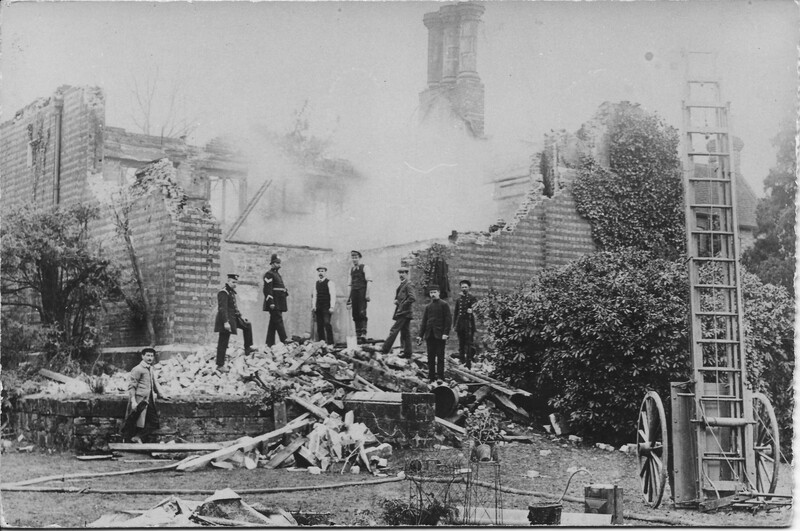 The dramatic photograph of the family and staff standing watching the fire was taken by Arthur Harding (1869-1947), who climbed the Church Tower to take this picture. Another picture shows people still at work on the rubble. 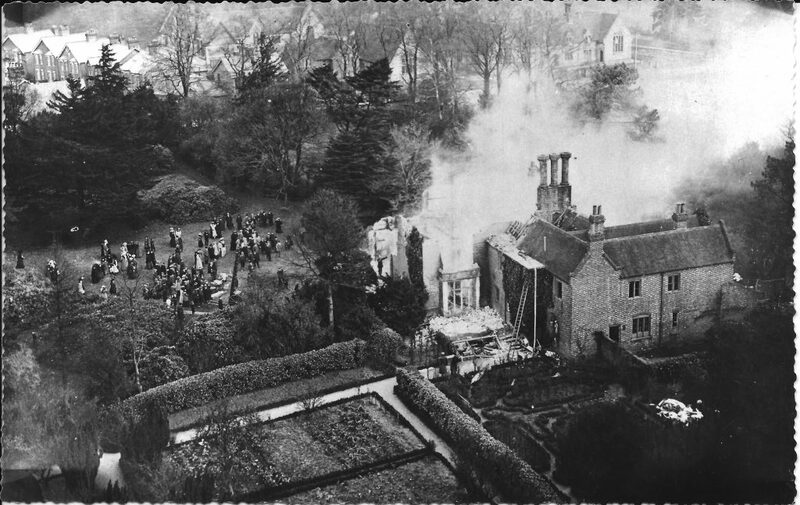 A third picture shows people watching from a hedge in the Vicarage garden. The Gas and Water Company were blamed for the inadequate water pressure and invited to contribute to the rebuilding, but they declined. The Vicar at that time was the Rev’d Douglas Blakiston, who was also an artist. He had been the Vicar of St Swithun’s since 1871, and lived in the Vicarage with his wife and their family. He was married to Sophia Matilda, nee Dent and they had 6 children. Writing about the eldest son, Herbert, biographer Clare Hopkins commented that in this household there was ‘an atmosphere of impoverished respectability’. Three of the boys had already died in sudden and early deaths, by 1908. After the fire, Douglas Blakiston retired: he had lost possessions of his own, and was badly shaken by the experience. He, his wife and their two daughters all died between 1910 and 1914, leaving only one son, Herbert Blakiston, who lived until 1942. This building was at least the second version of a Vicarage house on the site. 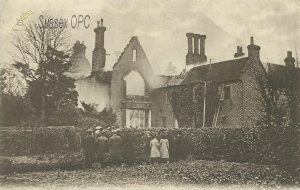 The older Vicarage was ‘nearer the church’, according to the 1946 Church Guide. Mr Leppard, in an article in the Bulletin of the East Grinstead Society, wrote that when the Vicar, Christopher Nevill, died in December 1847, Earl and Countess Amherst, as patrons of the living, commissioned extensive additions and alterations for the new Vicar, the Rev’d John Harward. In a surveyor’s report, a Mr Back wrote on 28 February 1848 that ‘It would be highly desirable that there should be fire places in three at least of the attics in case of infection and sickness. One might then be used as a Hospital’. It is not known if this idea for an early hospital in the Vicarage was put into place. The Vicarage that was rebuilt in 1848 and destroyed in 1908 was a brick and stone building, with massive internal beams, built mainly at the expense of Countess Amherst (1792-1864). Countess Amherst was born Lady Mary Sackville, the eldest daughter of John Frederick Sackville, 3rd Duke of Dorset. She married the 6th Earl of Plymouth in 1811. After his death, she married William Pitt Amherst, 1st Earl Amherst of Arracan, in 1839. Both marriages were childless. Her brother, the 4th Duke of Dorset, died in his 20s, in 1815, in a hunting accident in Ireland, unmarried and without heirs. He is buried in the Sackville Chapel at Withyham, where an inscription reads: ‘His premature death was by two Nations deplored as a publick calamity’. Countess Amherst and her sister, Countess De La Warr, became co-patronesses of Sackville College, the almhouse off Church Lane, founded by their ancestor. Countess Amherst and her second husband lived at Knole, the Sackville family house and estate. The Sackville family appointed the clergy for St Swithun’s after the Reformation. A new Vicarage was built in 1909, but this, in turn, was pulled down in the 1960s to make way for a new car park. So the Vicarage of today was built in the 1960s, and is at least the fourth version of the Vicarage building here. Amongst the ruins of the Vicarage that burnt down in 1908, a very old iron grave slab, dated 1616, was found. It had been used upside down, as a hearth slab, in that house. It was rescued and you can now see it on the floor inside the church, near the lectern. Guide to St Swithun’s Parish Church 1946.